As many of you know my latest project was a cradle for my new twin nephews who were born shortly before Thanksgiving. I was certainly inspired and motivated by Vic Hubbard’s cradle for his granddaughter Gretchin. I quickly learned that the good thing and the bad thing with building a cradle are the same: a deadline! Babies wait for no man. Twins have a tendency to come early, so the pressure was on. As a trained designer (not a furniture designer, however) I tend to put a good deal of thought into a project before delving in. I do as much research as possible. What are all my options? How can make this project unique? What are the practical aspects I need to consider? I obsess about such decisions. I go over and over them in my head. On our long drives back and forth to the country I get into the zone and mull over every aspect of a project. The big joke in our house is that I like to take long showers in the morning. I design everything in the shower. I figure out everything for the day. Crazy I know, but it works. So out of the shower and back to the topic at hand! To start, I made a laundry list in my head of all the things I needed to consider. #1:The babies. That’s a no brainer. But the truth is, as any parent knows, a baby will sleep almost anywhere, given the right circumstances. Tired enough a baby would sleep in a cardboard box, but that would be a boring thing to build, to blog about, and the parents might get bad looks if they put them in a box as if they were kittens. Which brings us to consideration #2: The Parents. Probably the single most important consideration. While this may be a gift, the parents are the ‘clients’. This piece of furniture needs to meet their needs. Luckily, as a parent of two children, I have ALL the answers and know exactly what all expecting parent needs and am able to predict the future for them (it drove me nuts when people would say ‘just wait…’). Anyway, the cradle really needs to meet the needs of the parents. Being able to rock the babies to sleep and the ability easily to put them in it and feel comfortable walking away. Parents are so overwhelmed with safety regulations these days surrounding cradles, it would be unfortunate to present something to the parents that they were not comfortable with. #3: The Aesthetic. As I said earlier, babies will sleep anywhere. Ian & Betsy (the parents) were using several pack & plays. Certainly functional, and you still need them to raise children, but maybe not in keeping with the living room furniture. I was setting out to create an heirloom piece of furniture that they could put in their living room and be proud of. After all, if you think about it, it is kind of funny to present a huge piece of furniture as a gift to someone and say “Here! Put this big honking thing in your living room!”. #4: Practicality. Size was obviously key. It had to fit two babies and leave them room to grow. This was not going to be a tiny piece. While I wanted to create an “heirloom” quality piece, let’s be practical: this is a cradle for twins. Ian & Betsy may not have more children, let alone a set of twins. So what do you do with this “museum quality” work of art in a year? #5: My skill level and time. While I am obsessed with woodworking, I am an amateur. I do this on the weekends, in between family activities and obligations. I needed to design a piece that was within my skill set. While I love to push myself, I had a deadline. These babies were on the way and they would not always fit in the cradle. They certainly would not wait for me to struggle though new techniques. I naturally took to Google images for inspiration. One of the very first images I came across stuck with me. It’s a rather modern piece that has a bit of Swedish aesthetic to it (read: Ikea look). As I kept researching, my thoughts kept bringing me back to this piece. The cradle I found answered several considerations, but above all I was sure I could actually build it. Then the designer in me took over. How could I improve upon this utilitarian design? Building it out of a wood other than fiberboard and plastic veneer was a start. I love cherry. So I chose: Cherry. Already this was looking better! I start scribbling out some rough sketches, really to get some overall dimensions. 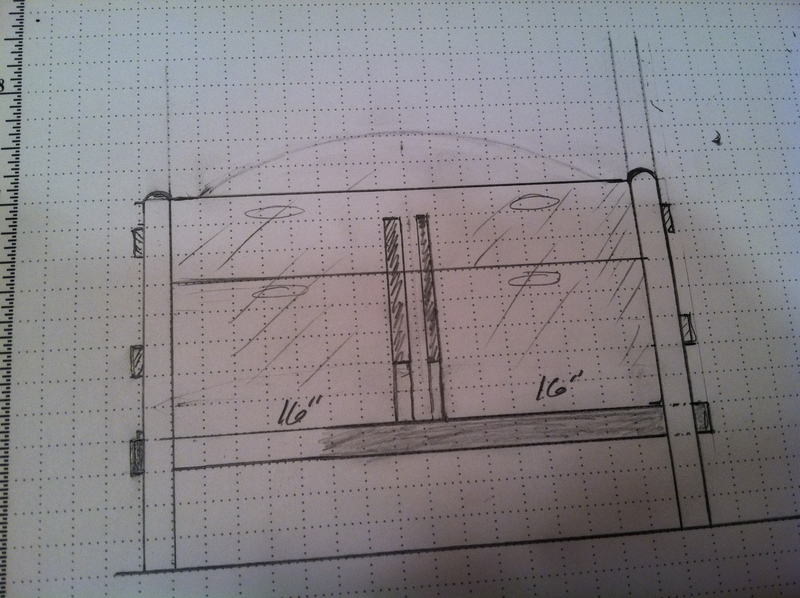 I made a flat mock up of the side to get an idea of the angles. This was very telling but I still felt I needed to really have this completely conceptualized and designed before I started cutting cherry. I laid out sticks of scrap to get sense of scale, angles and proportion. I did not have the luxury of time to be creative, in that sense, in the shop, and let’s face it- cherry’s not cheap. That’s when I decided I needed to finally take the bull by the horns and learn Sketchup. I had dabbled with it before, but this was an opportunity that would force me learn it. 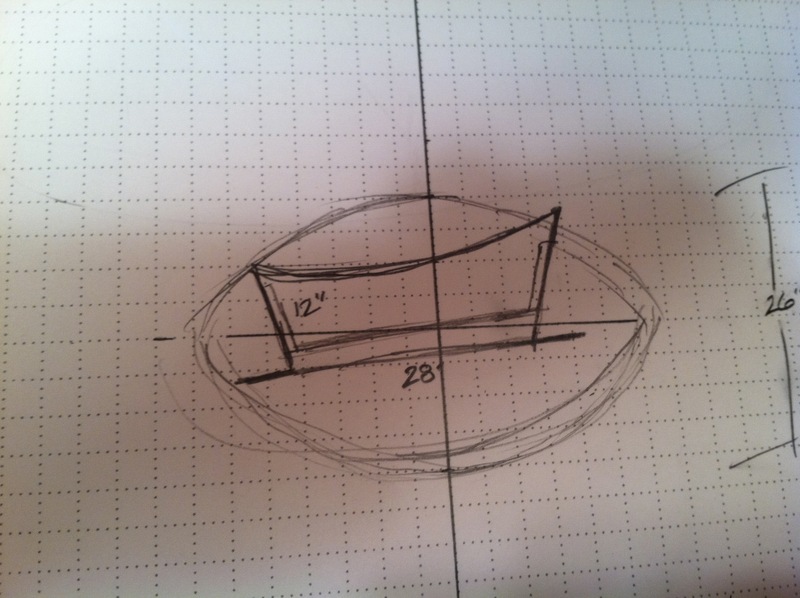 I was an excellent hand draftsman and did pretty well with Vectorworks, but 3D was something I just never had to do. So, I signed up for a two night class at 3rd Ward in Brooklyn. They offer amazing classes in all sorts of creative fields, including woodworking. The class gave me just enough to go on. I wasn’t a master, but I finally felt really comfortable. I spent a week fiddling around with different ideas. Sketchup really helped me land on some key design aspects. For me, who spends the entire week in the city, far from my shop, Sketchup was going to be my friend. So what did I discover? The first thing was that this was going to be a sizable piece of furniture! Thats when I decided it needed to be able to break down easily, both for our trip to New Hampshire, but also for storage once it has outlived it’s sole purpose and is retired to the basement. I then decided that I wanted it to go together without any hardware. It needed to be able to fit together with wood, and wood alone. I decided to create through tenons for the bottom, as well as the footboard and headboard that could easily slide into the sides. I worked on the symmetry and to be honest it all came together rather quickly. If anything it was my sketchup skills that slowed me down! I decided to lose the oval handles my research had provided. That seemed clunky and I could not see how they would be comfortable or useful for the parents. I pictured my brother-in-law, Ian, drinking beer and watching football, with the cradle in front of him. I decided it needed a foot rest that he could rock the cradle while chilling out on the couch. So I extended the base so it would make a comfortable foot rest. At this point I was really feeling good about the design. I did leave a few decisions up in the air to see how things progressed. 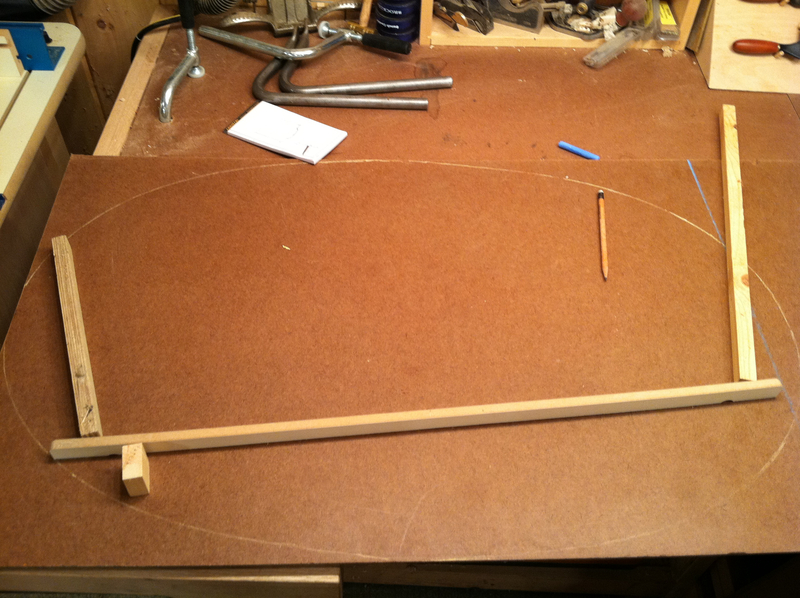 I needed to decide how to make the center divider come and go easily and I needed to fine tune the thru tenons and what I would use for pegs to hold them together. Overall, I was pretty excited. It was time to start building!…..
Fun Stuff! Great use of scraps!